Daniel H. Strait is professor of English and Associate Dean of the College of Arts & Sciences at Asbury University, where he has taught for 20 years. His research interests include exploring the intersections of literature, philosophy, and religion, especially in Shakespearean drama and Renaissance poetry (especially George Herbert). His doctoral research focused on the limits of religious language in George Herbert and Emily Dickinson. 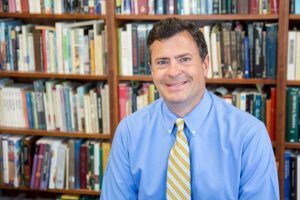 Dr. Strait is a member of the Renaissance Society of America (RSA), the George Herbert Society, and the Association for the Study of Law, Culture and the Humanities (ASLCH). Areas: Early modern literature, Shakespeare and Renaissance lyric poetry; Nineteenth-century American literature, Dickinson; Philosophy and literature. 2011-present. Professor of English and Associate Dean, College of Arts & Sciences, Asbury University, Wilmore, Kentucky. spring, 2017. Interim Chair, Department of English, Asbury University, Wilmore, Kentucky. 2005-present. Professor of English, Asbury University, Wilmore, Kentucky. 1998-2005. Associate Professor of English. Asbury University, Wilmore, Kentucky. 1996-1998. Assistant Professor of English/Assistant to the Dean for Humanities Faculty. Palm Beach Atlantic University, West Palm Beach, Florida. 1995-1996. Instructor of English/Assistant to the Dean for the Rhetoric and Communication Faculty. Palm Beach Atlantic University, West Palm Beach, Florida. 1992-1995. Instructor of English. Palm Beach Atlantic University, West Palm Beach, Florida. A.S.K. Grant ($2500.00) Center for Excellence in Teaching and Learning: Models in Innovation. Western Kentucky University. Awarded August 2012. 2005 NEH Summer Seminar: “Religious Experience and English Poetry, 1633-1985.” University of Notre Dame. Director: Dr. Kevin Hart, Notre Dame Professor of English and Concurrent Professor of Philosophy. Lilly Scholars Fellowship, Asbury University, 2003-2005. “‘Sudden Passing’: Herbert’s Poetics of the Moment.” George Herbert Journal 38.1-2 (Fall 2014/ Spring 2015): 54-65. “Chesterton, the Bible, and the Story of Redemption.” The Chesterton Review 38.1-2 (spring/summer 2012): 55-68. “’Making Room’ at McSorley’s Wonderful Saloon.” The Chesterton Review. 33.3-4 (Fall/Winter 2007): 641-652. “Chesterton, Borges, and Allegory.” The Chesterton Review. 30.1-2 (2004): 67-69. “G. K. Chesterton’s ‘Great Conversation’: The Art of Biography in an Inhuman Age.” The Chesterton Review 29.4 (2004): 499-509. “’Fighting Friends’: The Chesterton-Shaw Debates.” SHAW: The Annual of Bernard Shaw Studies Vol. 23 The Pennsylvania State University Press, 2003. 47-57. “Emily Dickinson and the ‘Balsam Word.’” In Emily Dickinson at Home. Ed. Gunther M. Grabher and Martina Antretter. Trier: Wissenschaftlicher Verlag Trier, 2001. 143-150. 2014 “The Judicious Reader and the Perilous ‘Middle Way’ in Robert Browning’s The Ring and the Book.” Association for the Study of Law, Culture, and the Humanities (ASLCH). University of Virginia Law School. March 10-11, 2014. 2013 George Herbert Symposium. “Herbert, Liturgy, and the Structures of Perception.” Charleston, South Carolina. March 8, 2013. 2010 Renaissance Society of America (RSA): Panel: New Directions in Early Modern Literature. (April 8-10, 2010). “Following Falstaff: Ethics, Morality, and the Literary Imagination.” Venice, Italy. 2003 “Of Wonder and Welcome”: G. K. Chesterton, the Eucharist, and the Liberal Arts. Asbury University. (April 4-6, 2003) (Conference Organizer). 2001 International Bernard Shaw Conference. Shaw’s Brave New World. Marquette University. “’Colossal Genius’: The Chesterton-Shaw Debates.” (April 18-22, 2001). 1999 International Emily Dickinson Society. Mt. Holyoke College. “Emily Dickinson and the ‘Balsam’ Word.” (August 14-17, 1999). “On the Moral Imagination.” The Chesterton Review 35.3-4 (Fall/Winter 2009): 821-825. “Chesterton and Dr. Johnson.” The Chesterton Review 29.4 (Winter 2004): 623-4. “Mr. Chesterton Meets Mr. Orwell.” The Chesterton Review 29.3 (Fall 2003): 450-452. “On Wonder and Welcome.” The Chesterton Review 29.1-2 (Spring/Summer 2003): 288-9. “Out of the Book and Into the Life.” Asbury College Ambassador Fall 2002. 13-16. “Foreward.” In Literary Criticism: An Introduction to Theory and Practice. 3rd Ed. By Charles E. Bressler. Upper Saddle River, NJ: Prentice-Hall, 2003. ix-xi. “Chesterton’s Cervantic Smile.” The Chesterton Review 27.3 (August 2001): 426-427. “Clouds, Curtains, and the Clear Light of Day.” The Chesterton Review 27.1-2 (Feb/May 2001): 108-112. “Immortality and Mr. Shaw” (Submitted Chesterton Letter) The Chesterton Review 26.4 (Nov.) 2000: 444. “A Note on the Light Within.” The Chesterton Review 26.3 (Aug.) 2000: 423-424. “Foreward.” In Literary Criticism: An Introduction to Literary Criticism and Practice. 2nd Ed. By Charles E. Bressler. Upper Saddle River, NJ: Prentice-Hall, 1999. vii-ix. Book Review. Shakespeare the Thinker, by A. D. Nuttall. New Haven: Yale UP, 2007. The Chesterton Review. The Chesterton Review 34.1-2 (Spring/Summer): 226-231. Book Review. Chesterton and Evil, by Mark Knight. New York: Fordham UP, 2004. The Chesterton Review 32.3-4 (Fall/Winter 2006): 433-437. Book Review. Rallying the Really Human Things, by Vigen Guroian. ISI Books The Chesterton Review 31.3-4 (Fall/Winter 2005): 241-244. Book Review. Shakespeare After All, by Marjorie Garber. New York: Pantheon, 2004. The Chesterton Review 31.1-2 (Spring/Summer 2005): 165-169. Book Review. Schall on Chesterton, by James V. Schall, SJ; Washington, DC: Catholic University Press, 2000; The Universe and Mr. Chesterton’s Universe by Randall Paine, Sherwood and Sugden, 1999. Seven: An Anglo-American Review 18 (2001): 93-96.